Are you ready for Kind of Batty- the newest, awesome release from Catherine Pooler Designs?! 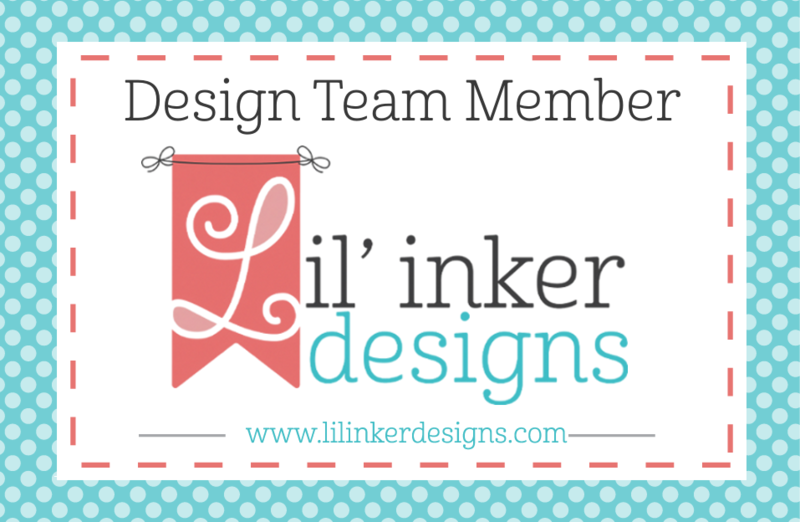 This collection features stamps, coordinating dies, stand-alone dies and two new ink colors. It is a delightful mix of Halloween, Autumn and every day. Wow! My first card features many items from the new release together, and I love how it turned out! I started with Sand Dunes Cardstock card base that had been stamped with the Angled Squares Background Stamp in the new Sand Castle Ink. Isn't that such a lovely combination? I then created some autumn leaves from the Hello Autumn Stamp Set and Hello Autumn Dies. The combination of inks I used were Sauna, Tiki Torch, Orange Twist and Mandarin Spice, then Limencello, Sauna, and Green Tea and the green combination is Sauna, Green Tea, Eucalyptus, and Spruce. I used the new Three of a Kind Dies (the first two layers) to create the focal sentiment, the color is Polished. I finished the sentiment from stamps from the Kind of Wonderful Stamp Set. 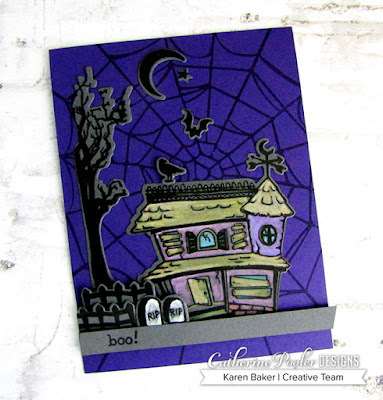 My next card features the show-stopping Spiderweb Background Stamp that pairs so perfectly with the Spooky Hollow Stamps and Spooky Hollow Dies! 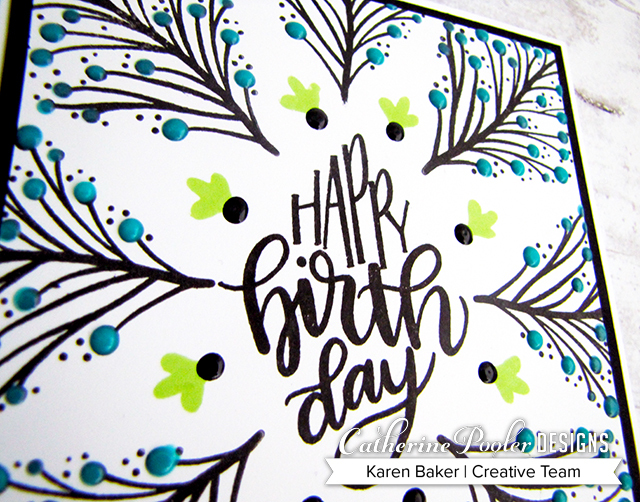 I did some simple stamping and coloring with Distress Oxide Inks. I stamped the Spiderweb Background Stamp with the new Twilight Ink onto some bright purple cardstock. I stamped some images from the Spooky Hollow Stamps onto Mirror Cardstock with Midnight Ink and then die cut them with the Spooky Hollow Dies, watercolored with Distress Oxide Inks and arranged them as a little scene onto the card. Please be sure to hop and comment, as there are prizes! 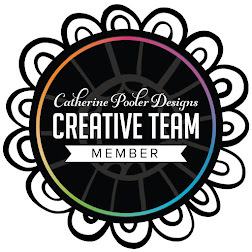 5 random winners chosen to receive a $25 gift certificate to the Catherine Pooler Store! Winners will be announced on Catherine's blog, the evening of Monday, August 20th. Karen Baker --- you are here! Love love love the leaf card. The sand dune ink is amazing. love love the leaf card. The sand dune ink is amazing. Love your leaves card. The colors you chose are amazing together. Love the colors on the Holloween card also. We on't celebrate Halloween though. Both cards are wonderful. 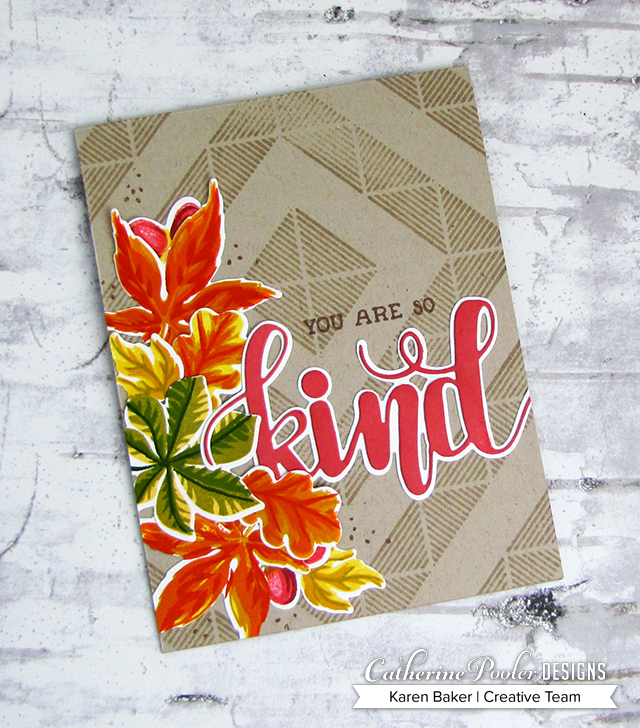 I love the leaf one...can’t wait to get these layering stamps! 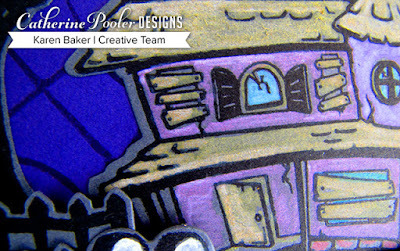 I so loved the haunted house stamp and your card you made with it! Wonderful work!! Very pretty and a very spooky cards!! What a wonderful haunted house example. Can’t wait to try these new items. quite a contrast. Great card. Not a huge Halloween person but love the cards made. Love the colors in the autumn card. Fabulous cards. I am loving the angled squares background stamp more and more each time I see it used.Your autumn card’s design is awesome. I love your colors and arrangement. The spooky card is so cute. I’m a big sucker for cute Halloween products, and the haunted house I saw a must have in my book. WOW - - I really like the Sand Dunes CS under those wonderful, deeply colored autumn leaves. Great ideas and very nice. Great cards, I especially like the first one. The little girl in me is jumping up and down at the Batty release. It's on my hit list just as soon as I can. What a great release. The cards you created are stunning. Thank you for sharing. Fabulous! The haunted house really made me smile. Super cute. Both cards are amazing but I kinda like the Halloween card more. Thank you for sharing! I love the way you incorporated the pink Kind stamp in with the autumn colors.The haunted house is...haunting! The first card is so gorgeous and the haunted house is amazing. Your Halloween card was great! Love that set. Awesome cards! 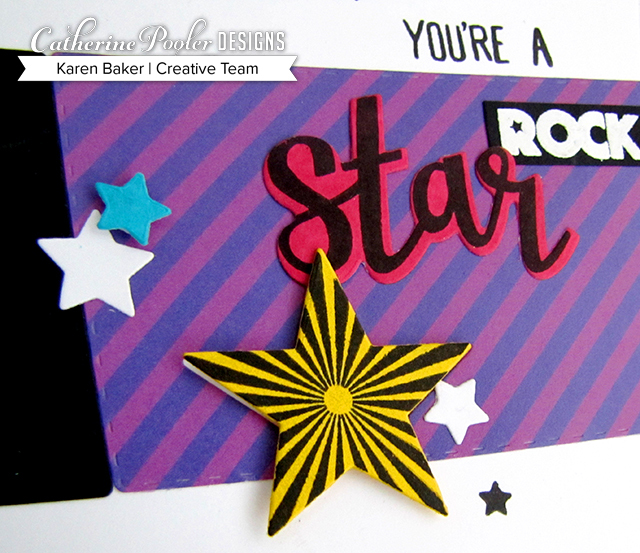 These layering stamps are so pretty and I really love the Angled Squares background. I’ve never been a Halloween card person, but this stamp set is changing my mind! The spooky house is fantastic! I absolutely LOVE your Halloween card. Love the colors you used and the cob web as a background. Fabulous! Love, Love, LOVE your haunted mansion! Awesome! Thank you so much for sharing with everyone! God Bless You! Awesome cards! Gorgeous autumn leaves, and a delightful Halloween scene! Beautiful and fun cards! Amazing details and layouts. Two different but gorgeous cards. I especially love the halloween card with spooky house. Gorgeous cards! Love them both and these stamp set and die cuts sure will be on my waiting list. Thank you for sharing with all of us. Karen, your cards are beautiful - love both of them and I like the neutral color background on the Kind card. Very pretty. Love the leaf card. Looking forward to using the new inks. Great cards! 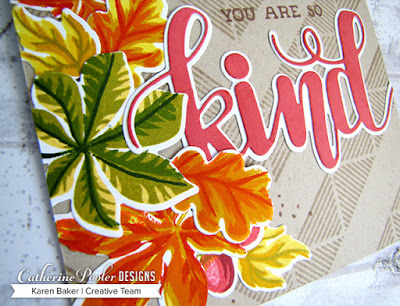 love, LOVE, love that leaf card Karen! The colors are gorgeous! The leaf card is great love the colors. Hope this comes up, tried to post yesterday would not post. Beautiful cards! The halloween one is so cute! Love your cards. So excited for the new ink colours. When my order arrives I will be the proud owner of all the CP Inks. Woohoo! Great cards. I like the background and the colorful leaves on the first one. Great way to combine so many lovely stamps on the first card. The haunted house card is wonderful! That tone on tone background is ah-mazing. And love your Halloween card . . . cute scene. That leaf card is so amazing - I love it.